Description: While wild strawberries have existed for more than 2,000 years, they were not cultivated until the late 18th century in France. Wild strawberries, while smaller, have more flavor than domesticated strawberries. Until the mid 19th century, strawberries were only enjoyed by the wealthy as before trains they would never travel fast enough for the strawberries to stay fresh. There are over 600 types of strawberries that vary in size, texture, and flavor. 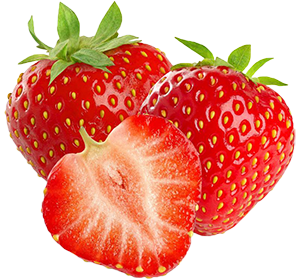 Nevertheless, all strawberries are red with a small green leaf and stem from where it was attached to its plant. To choose strawberries look for firm strawberries that are free of mold, a deep red color, and have green caps attached. Kitchen Pharmacy: Strawberries contain quercetin, which has antiviral, anti-carcinogenic, and anti-inflammatory properties. Strawberries are also a great source of folic acid, potassium, manganese, fluorine, copper, iron, iodine, vitamin C, vitamin A, and vitamin E. In addition, strawberries help prevent aging, cancer, inflammation, and Age-Related Macular Degeneration; while improving the regulation of blood sugar and motor function.